Happy Birthday Miri! - Mit Spaß Selbstgemacht - Kleinigkeiten die Freude machen! Happy Birthday Miri!!! Hope you have a wonderful day! 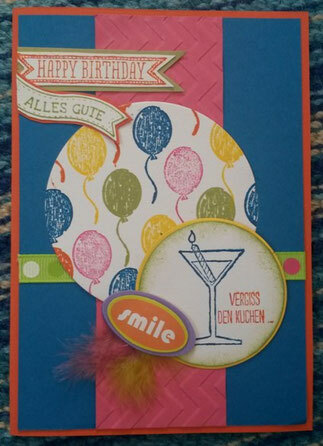 A card for Miri always has to be full of colours, so I chose Tangerine Tango, Gumball Green, Daffodil Delight, Pacific Point and some No Name Pink. The martini glass stamp is from the set "Making spirits bright", it translates "Forget the cake" (I bought the set mainly because of that funny stamp). I forgot the name of the set with the balloon... will look it up.